Tomato time is here again! Before we even harvested any tomatoes, we’d spent a lot of time with the plants. We trellis the tomatoes, wrapping twine around stakes placed every two plants and tightly binding the tomatoes to force them to grow upright. We also “sucker” the tomatoes, which means pruning the side-shoots that appear in the crotch between main stem and leaves. If you let the suckers grow, the new stem competes for nutrients with the original plants: you may see more fruit, but the plant will struggle to ripen them all. Suckering also allows for more air to circulate, which prevents disease. Suckering is especially important for indeterminate varieties of tomatoes that will grow bushier and too heavy for their trellises if left alone. These regular tasks mean we spent much of spring and early summer watching and waiting for the first tomatoes to ripen. It’s amazing how different the foliage of each variety looks before the different tomato colors and shapes are evident. 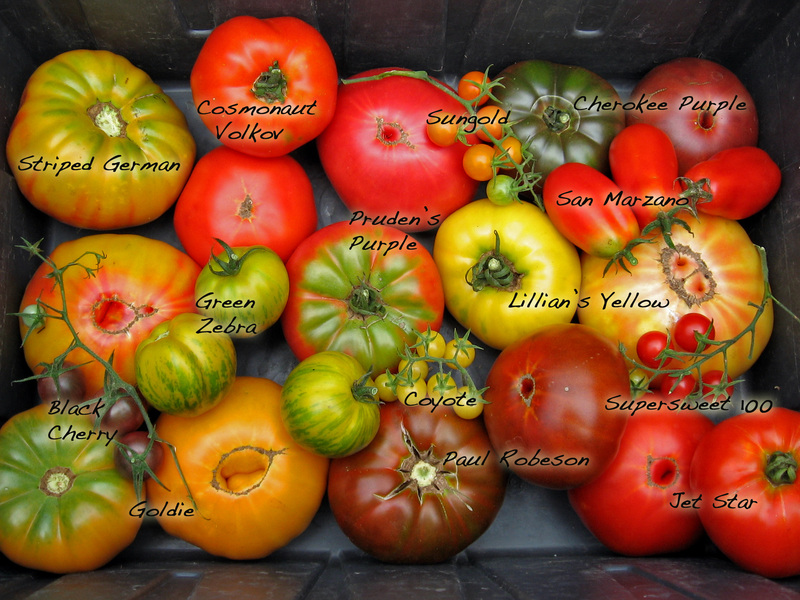 Unlike many newer and hybrid varieties of tomatoes which were bred for thick skins and easy transport, heirloom tomatoes were bred for unique taste and appearance characteristics. I’m continually amazed by heirloom tomatoes once they ripen, by the taste differences and the gnarled brown cat-faces and the sheer diversity of appearance. In the pick-ups, you’ll notice some of these varieties appearing. This past week you may have seen some of the Cherokee Purple. They are a deep, dusky color, but they might have green shoulders even when ripe. We’ve also been picking the first Prudens Purple, a pinkish tomato and Goldie, which is yellowish orange and sometimes as big as the palm of my hand. We’re also growing a Ukranian red slicing tomato called Cosmonaut Volkov. The seed catalogue describes them as a “perfect blend of sweet and tart” and I agree! There are a few more varieties to look forward to: we’re just beginning to see ripe Green Zebra and Striped German! Some varieties are doing better than others. We’re seeing a lot of blossom-end rot on the more oblong, dense, San Marzano Paste tomatoes. Blossom-end rot happens when plants have trouble uptaking sufficient calcium from the soil and also transferring it through the plant. We’re picking off these tomatoes early, hoping the plants will recover and produce fully ripened tomatoes unencumbered. There’s so much to say about these tomatoes. Everyone has their own opinion about taste and the perfect ripeness. Along with the heirlooms, we also grow some irresistible hybrids: for example, there’s no better sweetness to me than a bright orange Sun Gold cherry tomato. We hope in your share you enjoy exploring the different tomatoes! Let us know what you find!